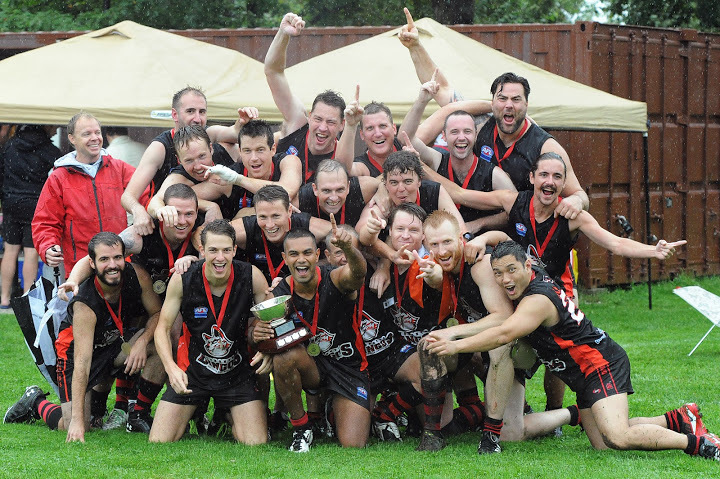 On a rainy Saturday morning the Dingos division two squad arrived at Humber South looking to complete their perfect season and win the club’s first ever Division 2 premiership. With 18 players dressed, the Dingos agreed to field 12 a side to allow the undermanned Hawks to have one spare player on the bench. The Hawks came out of the gates quickly, and the Dingos looked on the back foot early as they trailed by two goals midway through the first quarter. Some undisciplined play across the ground meant that the Hawks were gaining a lot of free kicks and the Dingos couldn’t get any sort of flow into their game. A great crumbing goal to JV Arnaldo near the end of the quarter reduced the Hawks lead; however, when the quarter time siren sounded the Dingos found themselves trailing for the first time all season. Aware that they were not playing the brand of footy that they had excelled at all season, the red and black knew that they needed to play with more composure and discipline if they wanted to be premiers. The midfield got on top of the Hawks early in the second quarter as Jim Sheehan, Tom Evans and Alvin Ranchhod began to dominate the clearances and present around the ground. Paul Tinkler gave the Dingos their first lead of the day when he kicked a miraculous left footed snap from deep in the forward pocket. This was followed up by a great running goal to Matt Pollett that was set up by some hard work on the wing by Robert Fitzhugh. Having held the Hawks to one point for the quarter, the Dingos led at half time by three goals. With momentum now in the Dingos favour, they knew that it was important to get on top early in the second half to quash any Hawks hopes of a comeback. After JV’s second goal of the day was followed by another major to Tom Evans, the Dingos lead had become insurmountable. The final quarter saw the Hawks pile on the pressure, but it was to no avail as they could only register three behinds against a Dingos backline that included a brief cameo appearance from goal kicking sensation Ben Kavenagh. JV registered his third goal of the match to ensure that the Dingos ran away with a 38-point victory. Credit must be given to the Dingos’ backline as it held the Hawks to only three behinds in the final three quarters of the match. Drew Bremner, Joe Carrig, Ryan Cross, Roman Belli and Gary Conlon shut down the Hawks forward line while at the same time rebounding the ball to create many of the red and black’s scoring opportunities. Well done to the mighty Division 2 Dingos on completing a perfect season and securing the first Mike Pyke Cup in Dingos’ history!